In April, hundreds of Nicaraguans mobilized in the streets to protest the government’s apathy in the face of the fire of the Indio Maíz Reserve and later for the social security reforms that hit insured and retired people. The State responded with the repression executed by the National Police. The youth rose indignantly from the universities and surrounding neighborhoods. The indignation grew and multiplied when the first one killed by the National Police shots fell. Since then, a civic insurrection, in whose vanguard the youth has been, has been brewing throughout Nicaragua, with protests and mobilizations, takes of university campuses, barricades, mobilization of peasants, dams, national strikes, caravans, marches, disobedience student, pilgrimages, vigils and seedlings. The Town recovered the public spaces, the streets, the monuments, the music and squares. Nicaraguans abroad have accompanied this civic insurrection with a gigantic network of solidarity that has mobilized consciences. All of us have demanded a single voice Justice and Democracy! A huge deployment of the National Police and para-police forces has been at the head of the repression that has already claimed the lives of more than 300 brothers and sisters; thousands have suffered kidnappings, hundreds still remain in prisons and are prosecuted in illegal trials; Thousands of compatriots have been forced into exile by persecution and threats, and hundreds have been displaced from their homes and places of habitation by threats and harassment Ortega. The regime has unleashed violence against those who claim to exercise our right to civic protest and demand the establishment of justice, civil liberties and democracy. The right to life, to personal integrity, to peace and tranquility have been violated. The right to civic protest has become a crime. Nicaraguan families are insecure and threatened. By the will of the regime, the economic situation deteriorates, causing thousands of people to lose their jobs and hundreds of small businesses are closing operations. Dozens of people suffer land seizures executed by forces of Ortega as punishment to their owners. The Ortega propaganda has tried to disappear the murdered people, while glorifying the murderers. A campaign of lies is carried out nationally and internationally by spokesmen of the dictatorship, who accuse the people who protest of vandalism, criminal, coup and terrorist; to act as an instrument of foreign interests and even organized crime. The regime has also accused the bishops and priests of coup plotters and terrorists. 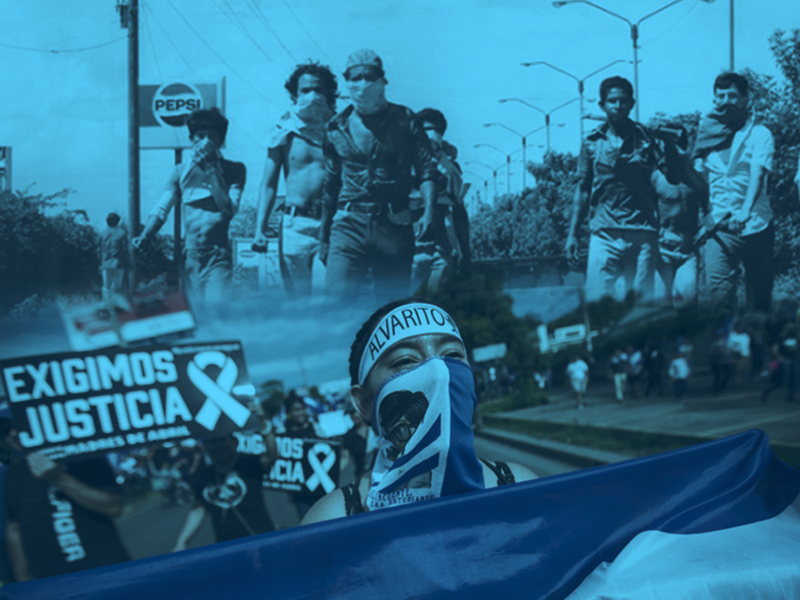 International human rights organizations such as the Inter-American Commission on Human Rights (IACHR) have also been accused of producing false reports about the situation of Nicaraguans. The dictatorship has taken its accusations to the Organization of American States (OAS), pointing to various countries to be part of a supposed coup plot. Not one of the lies of the Ortega – Murillo regime has been believed. International condemnation is proof of that. We accuse the Ortega-Murillo regime of kidnapping the State and its institutions, turning them into blind and docile instruments of the family in power. We accuse the dictatorship of kidnapping popular sovereignty and democracy: of preventing us from deciding on our own destiny, our life as a free people, the political and economic course of the nation, which we are all responsible for because they affect us all. We accuse the dictatorship of being established and maintained in power by electoral fraud, the outlawing of the opposition, intimidation, bribery and perks. We accuse the regime of mocking the hope and aspiration of thousands of Nicaraguans to a society with opportunities and equity, delivering crumbs in programs conditioned to political unconditionality, discriminating and humiliating the most needy people. In Nicaragua, inequalities and poverty prevail. Thousands of Nicaraguans have been forced to migrate. Young people, women and men do not find opportunities. Workers do not see their condition improve. Meanwhile, valuable external resources of Venezuelan cooperation have been used to enrich the Ortega family and their relatives. We accuse the dictatorship of kidnapping justice, taking it to the extreme of serving its model of repression and violence. We accuse the regime of masking and denying violence against women, of falsifying the figures of femicide and of weakening the institutions that prevent and confront it, while manipulating a discourse to promote equal opportunities between women and men. We accuse the dictatorship of kidnapping the regional and municipal autonomy, as well as the community autonomy of the indigenous and afro-descendant peoples of the Caribbean Coast, who are denied their culture, customs and traditions and their territories are occupied. We accuse the regime of pledging national sovereignty with the concession of the national territory for the construction of the so-called interoceanic canal, threatening to take away their land from thousands of peasants. We accuse the dictatorship of having liquidated the autonomy of public universities and of sponsoring parasitic sectors and organizations of the Ortega that have confiscated the right to decide of the university students, their right to free organization and the accountability of 6%. For the massacre in Las Jagüitas in 2015, in which three people died; for the murder of six people, including the children of Doña Elea Valle, two minors criminalized, committed in the Cruz del Río Grande in 2017. For the murder of more than 34 indigenous and Afro-descendant leaders in the North Caribbean. For all of them: young and adult children, leaders, opponents and dissidents to the regime, victims of repression and murder for more than 11 years, we accused Ortega’s dictatorship. For kidnapping the lives of hundreds of kids and girls, university students, neighborhoods, communities and territories. We accused the regime of shooting and assassinating Nelson Téllez Huete on April 20; to Alvarito Conrado, brave young man of 15 years, to whom a bullet silenced his voice when he supported the struggle of the university students in the area of ​​the National University of Engineering (UNI); José Abraham Amador, from Masaya, in the clashes near the Handicraft Market of this city; Richard Pavón, age 17, in Tipitapa; the journalist Ángel Gahona, murdered in cold blood in Bluefields; to Michael Humberto Cruz Sánchez, at the Polytechnic University of Nicaragua (UPOLI), a symbolic bastion of the April struggle; Franco Valdivia Machado, killed by snipers in Estelí; Marcos Antonio Samorio near the area of ​​El Zumen in Managua; Alvis Yamil Molina, in the Batahola Norte neighborhood in Managua; to the Pavón family in the Carlos Marx neighborhood, where 4 adults and 2 innocent children died locked up and incinerated during the cleaning operation in the eastern neighborhoods of Managua; Gerald Vásquez López (“El Chino”), 20, and Francisco Flores (“El Oso”), 21, in the attack on the Church of Divine Mercy while fighting at the National Autonomous University of Nicaragua (UNAN) ; the brutal attack against bishops, priests and Apostolic Nuncio in the Basilica of San Sebastián in Diriamba and the Parish of Santiago in Jinotepe; the young people killed in the massacre of the March of Mothers and the March of Flowers; for the murder of Sandor Dolmus, altar boy of the Cathedral of León. The Ortega regime shot at each of the murdered and murdered in every corner of the country. We accuse the dictatorship for the dozens of disappeared, whose families seek, without any response. We also accuse him of using clandestine prisons and sexual violence as a mechanism of torture. We accused the dictatorship of Ortega y Murillo for besieging, intimidating, persecuting, repressing, kidnapping and murdering, making use of the National Police, its mobs, shock groups and para-police forces, judges, prosecutors and jailers, to the people of Nicaragua in Civic protests throughout the country. We accuse the regime of discarding and offending national symbols, the blue and white flag and the national coat of arms. We accuse the dictatorship of trying to kidnap the truth and the reality through the use of its media emporium built over the last 11 years with the wrong money. Not content with this, they have repressed the few independent media, through censorship and intimidation, for that reason, we also accuse them. We accuse the dictatorship of wanting to kidnap the will of the people to build a New Nicaragua and to try to demobilize it through siege, the criminalization of civic mobilization and the kidnapping of its leaders. We accuse the regime of imprisoning thousands of Nicaraguans and holding as hostages Medardo Mairena and Pedro Mena, leaders of the Campesino Movement, Christian Fajardo and Maria Adilia Peralta, leaders of the April 19 Movement, of the heroic Masaya, to Rodrigo Espinoza, Hansel Vásquez Ruiz and Marlon Fonseca, of the National Movement April 19, to Ireland Jerez, leader of the autoconvocados of the Oriental Market, to Olesia Muñoz, leader and Catholic activist of Niquinohomo; Brandon and Glen accused of a crime committed by Ortega. For them and them, we demand Freedom, Freedom, Freedom! We aspire to a Nicaragua with justice and democracy. Those of us who have mobilized during these months aspire to a Nicaragua with justice and democracy. We want justice for each and every one of those killed, injured and wounded. Let the guilty parties be identified and pay for their crimes. We want a country in peace, without paramilitary forces that threaten the life and integrity of Nicaraguan families. With a police force that serves everyone and is not the repressive force of a family in power. We want a country with democracy, without electoral fraud, with respect to our human rights, with full force of the constitutional rights of all Nicaraguans. We want a government in a State of Law, with institutions that serve all. We are convinced that the situation in Nicaragua can be resolved through the civic mobilization of the people and the national dialogue. Our door has been open, but the regime has closed its own, confident that repression would overwhelm the Nicaraguan people. 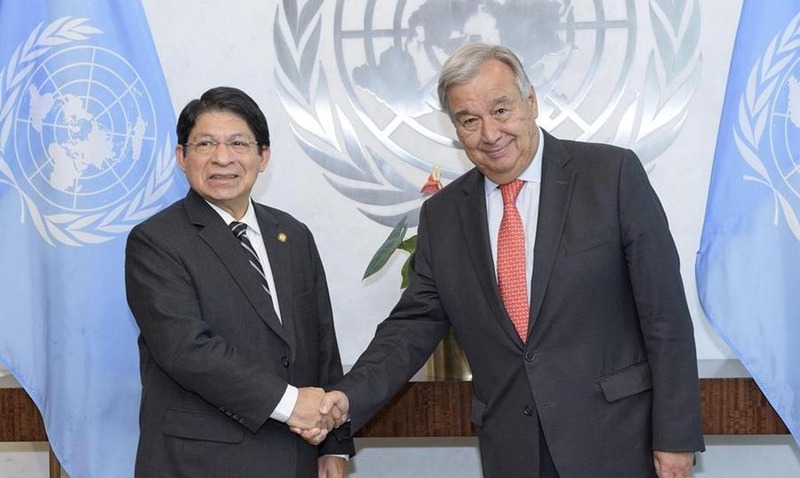 Ortega has boycotted all dialogue efforts, tried to delegitimize the Nicaraguan Episcopal Conference (CEN) in its role as mediators and witnesses and has tried to intimidate the Civic Alliance with threats and the imprisonment of one of its members. The Ortega-Murillo regime has not been able to recognize that it is finished and that it is responsible for the chaos; that he has no legitimacy for the dubious elections that have brought him to power and for the killing he has caused; that he can not continue to govern because he is incapable of managing power and administering order and stability unilaterally, an incapacity that is creating a crisis of insecurity and uncertainty for Nicaraguans. Faced with arrogance, it has not taken the steps that the moment demands for Nicaragua to move towards freedom, justice and democracy. With Ortega in power no development is possible, that’s why we accuse him. It has become clear that the regime does not want peace, order, stability, justice and freedom for the people of Nicaragua. History will condemn the regime Ortega – Murillo! Our vocation and decision as a people is about civic struggle and dialogue. To demand, from all possible spaces, the reinstatement of the National Dialogue with the CEN as mediator and witness, and incorporating appropriate international guarantors. Dialogue should serve the Nicaraguans to build political agreements that propitiate a solution to the national situation. The cessation of repression and reprisals in all its forms; the disarming of para-police forces and other armed civilians, with international supervision, as well as the cessation of the criminalization of protest and the arbitrary and illegal prosecution of those who protest are essential to achieve a fruitful dialogue. Dialogue is called to define the convocation of anticipated general elections, free, transparent and competitive, with national and international observation so that Nicaraguans in an atmosphere of peace and freedom can decide who should govern the country. Let us continue the peaceful and civic mobilization, as we have done, with the conviction that this is the way, to unfold all forms of collective action, throughout the national territory. Strengthen the unity of all organizations and social expressions in neighborhoods, communities, counties, municipalities, departments and at the national level, under the blue and white flag. Develop protest and mobilization days to demand the immediate release of political prisoners and prisoners, the annulment of all illegal processes. Express our effective solidarity to their families and our support for the actions of defense and denunciation of their condition as hostages of the dictatorship. Let’s continue to denounce, in all international spaces, the violations of Human Rights that the dictatorship continues to commit. We must be sure that we are not alone and that pressure from the international community through greater isolation and sanctions are key to achieving freedom, democracy and justice in Nicaragua. We are close to achieving Nicaragua with peace, justice and democracy. We are a people with vocation and decision to move forward and for those who have had consequence and generosity, we will achieve the new Nicaragua.